Suffolk Naturalist: Leaves, Starlings and a Sparrowhawk too! Hello dear reader, hope this finds you nice, snug and warm, wrapped up against the chilly weather outside. The leaves are at long last beginning to fall and my garden is covered in the beautiful autumnal colours of brown, reds and yellows. Many of you will be starting to dig the rake out to scoop them all up to either stick in the composter or to make a small slow burning pyre from. But there is another important use they have and one I think you should consider. Leaves are not just pretty green things that hang of trees, they have a very important function in the the grand food web which we discussed last time. Firstly, through the process of photosynthesis, they combine and convert the sunlight energy, water from the soil and the carbon dioxide we exhale, into a chemical energy such as sugars which the tree/plants can use as food. A wonderful by-product of this process is oxygen which we need to survive, so trees/plants are your friends, remember that. But this is not the only thing they are good for as leaves are a host to many other important organisms which have their place in the environment. Some moths known as micro moths 'mine' the leaves as a larval stage. This involves the very small caterpillar that hatches from the egg which was laid on the leaf by the parent moth which sometimes measures no more than 2-3mm long. This gives you some idea how big the egg and the larvae are. The caterpillar would then make a small hole on one side of the leaf and then burrow in between each side of the leaf so that it is actually inside the leaf. Now considering how thin some leaves are, this is quite an amazing feat. You can tell when a leaf has been mined and you may have in fact seen this type of thing before without realising what it was. As the caterpillar munches its way through the interior on the leaf, it leaves behind a trail which can be seen in the pictures below. Here, the white zig-zaggy lines can be clearly seen. Sometimes, if you hold it up to the light, you might be able to see the larvae inside or, even some of its frass. Some species of micro moth overwinter within the leaf or the leaf litter when the leaves fall to the ground in autumn. Another insect that uses leaves are gall wasps who implant their eggs into the leaves of trees. This implanted egg has an effect on the chemicals in the leaf surrounding the egg/insect and this causes a growth to occur which can either act as a protective shell around the developing insect or, act as a source of food for it during development. Galls on the underside of an oak leaf. Again, come autumn when the leaves fall to the ground, the developing insect inside overwinters amongst the leaf litter. So why is this leaf litter so important? The simple answer is warmth. If you have a compost bin that the council collect full of leaves or grass cuttings or, you might have a pile of leaves/grass cuttings in the garden, you might notice that the bin may be warm to the touch or that the pile of leaves/grass seems to be steaming. If you carefully place your hand into the leaf pile, you will feel the heat being generated. But what is generating this heat? Amongst all this leaf litter are micro organisms, detritivores, who munch away at all the dead vegetation on the ground. All this hard work generates the heat within the litter and provides a wonderful little micro climate in which all those invertebrates within, survive. This process helps many invertebrates get through the harsh, freezing temperatures of winter. When the ground is covered in frost or snow, and temperatures fall to zero or below, in amongst the leaf litter, the temperature is 1-3ºC above zero, stopping the insects within from freezing to death. This warm layer also provides protection to any seedlings on the ground or any dormant plants from frost damage. Worms, which keep our soil aerated, love to munch on a leaf or three over the winter period. They slide up out of the ground, grab a leaf in their mouth and then retract back down the hole pulling the leaf with it. As these leaves are eaten and destroyed they release vital nutrients back into the soil around the tree they fell from, which in turn provides important rich nutrients for not only the tree next year, but also the plants and other insects that also depend on these nutrients as well. So, at this time of year, you will find me raking up the leaves in the garden and instead of placing them in the composter, I spread them over my flower beds about 3-4 inches deep. This process helps to keep some of my plants protected from the frosts, keeps the soil above freezing and the biodiversity of my garden rich and varied. Pile it on. Leaf litter spread deep over my flower beds. So before you go chucking those leaves into the compost bin, just think again about what good they could do your soil with all those lovely rich nutrients. Think about all those wonderful creatures that depend on the energy trapped within those beautiful colours and then go and spread them on your flower beds. I've been doing it for a couple of years now and the amount of colour from flowers that I got back this year was lovely, something which I attribute to my leaf spreading. After all, before mankind was on the scene taking pride in his garden, what happened to the leaves then? Over the last few weeks, I've been on the look out for a murmuration of starlings. This is where starlings gather in huge numbers and fly back and forth creating huge patterns in the sky that are mesmerising. Earlier in the year, I captured this event on video not far from me in the east of Ipswich near Ransomes Europark industrial estate. 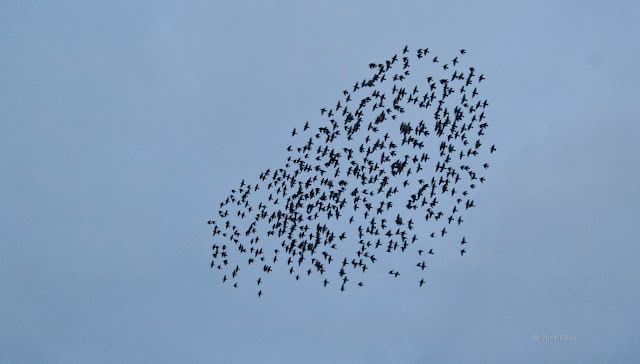 My neighbour had said he spotted a small flock of starlings in the same place recently looking like they were trying to start a murmuration (thanks Mick). Anne, a regular reader to this blog (Hello Anne) also contacted me to say she had spotted around 120 starlings not too far from Ransomes as well. So, last night I had some time available to me and went to have a look to see if anything was happening. I drove straight onto the industrial estate to see what I could find and it didn't look promising as I sat waiting, scanning the skies for any movement. But after about 5 mins I spotted a small flock of about 30 starlings flying over the entrance to the estate where Nacton Road meets Ransomes Rd. I pulled into the Thrashers Pub car park, where I spotted the murmuration earlier in the year, and waited. Sure enough, within minutes a flock of about 100 flew over in cloud formation. The gathering murmuration had begun. They kept on flying back and forth and at one point as they flew towards the tall trees behind the pub I was taken by surprise as a sparrowhawk (Accipiter nisus) came up from behind me and flew past my head and into the trees. Had it made a catch? At that point I wasn't too sure as the light was already fading and the dark back colouring of the sparrowhawk coupled with the dark silhouette of the trees made it hard to tell. However, the murmuration continued its fantastic display above the rush hour traffic gathering below, then all of a sudden, the starlings flew low down and towards me filling the eyepiece of my camera as they made a rather quick and dramatic split into several smaller groups above my head. They passed overhead and then I saw again the sparrowhawk fly back from the direction of the pub towards the industrial estate and I could quite clearly see that this time it had dinner clasped firmly in its claws in the shape of a starling. As it approached the trees surrounding the estate, to crows left their perches to try and mob the sparrowhawk, but it quickly out flew them and found sanctuary in the darkness of the conifers around the estate. Again, although I could see it clearly with my eyes, it was still too dark for my camera to try and get an action shot, that it happened so quick. After this, the murmuration, now about 200 birds strong, moved deeper into the estate. I got in my car to follow them but the light was beginning to fade much quicker now and photographing them was no longer an option. One thing I did notice whilst I watched this magnificent display was that all the while as they flew back and forth, every now and then a much smaller flock of 5,8,10 or 15 birds would fly in and join them. I have seen this before in my hippy days of living on a boat on the broads. One evening watching a huge murmuration near Barton Broad in Norfolk from about a mile away. 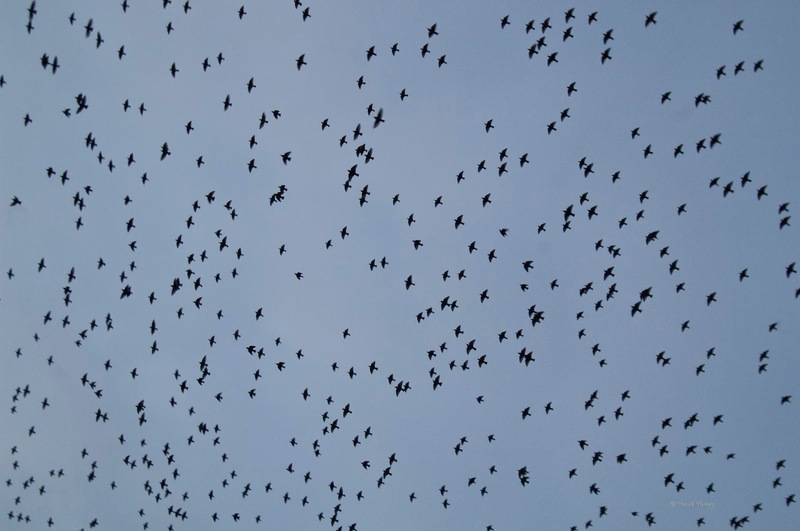 Yet every now and then a small flock of starlings would fly over my head, heading towards the murmuration. So maybe these murmurations are a way of communicating to all the surrounding flocks of starlings that, 'we're all sleeping here tonight, come join us if you want to be safe'. After all, safety in numbers usually works, although try telling that to the sparrowhawk's dinner. A sky full of starlings. I will try and keep an eye on this murmuration over the next few weeks to see if it gets any bigger, hopefully it will. However, if you do want to see a much bigger murmuration, apparently, there's a flock of around 30,000 starlings on the river Alde between Snape maltings and Iken. These larger murmurations are really fantastic and awe inspiring to watch. If I get the time, I may try to go this weekend, fingers crossed. That's about it for now, till next time dear readers, take care. We enjoy watching these murmurations at Snape and (near) Walberswick ... but the one you mention is much closer to home. We are talking corvids here, as opposed to Starlings, but I just love the description of these formations in Mark Cocker's 'Crow Country'.